Seeing this place, maybe you'll remember the rainbow. Riomagiorre village in Italy has colorful buildings, perched just above the cliff, set in green hills, and overlooking the blue sea. Very beautiful. 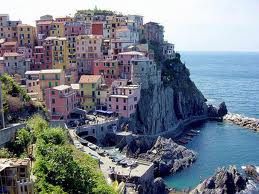 Italy had an area called Cinque Terre. In it, there are five small villages perched on the cliff. 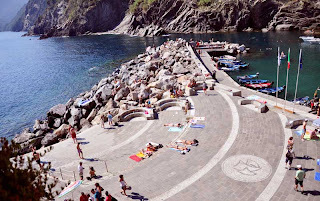 One of them is Riomaggiore, the village's most often used as the object of the artists paintings. Riomaggiore allure blue sea is not just perfect, or so the old green hills background. Riomaggiore filled with colorful painted buildings: yellow, green, orange, brick red, blue, to the pastel colors like pink and turquoise. The village will make the visitors never stopped amazed. Instead of paintings, dozens of camera shots were not quite capture it's beauty. Riomaggiore enough to surround the foot, given the size of the village is quite small. There is only one main road that divides the village. You could walk to view and chat directly with local communities. Do not be surprised if you find a lot of boats are perched on the streets. You see, the road is straight to the high seas! If you arrived at the port, do not stop once you step. Walk continues along the path at the edge of cliffs. Approximately 250 meters later, you will arrive at the best point to see the panorama of the Mediterranean Sea. Especially when the sun goes down, there's nothing blocking your view of the light source is perfectly round that slow down to a contest. Maybe this is not a good thing to do, but for the adrenaline junkies, jumping off cliffs into the Mediterranean Sea is a normal thing to do. The traveler is often compete with local residents to measure their level of courage. But do not worry, there are some other things you can do if not interested in throwing themselves into the blue ocean. You can visit the neighboring villages are just as beautiful, as Manarola and La Via Dell'Amore. Such regions in Italy, you can also taste the famous local pasta delights. Do not forget to sip Sciacchetra, typical local wines that will add flavor your food.